What Past Shoes Would You Have Liked To See With All Star Themes? Which classic kicks from All Star Games would you like to see in special All Star themes? The first All Star Weekend I ever attended was Las Vegas in 2007, and it’s a weekend I’ll never forget – for a lot of reasons. First, and most obvious: it was my first All Star Weekend! That alone, as a lifetime basketball fan, was exciting enough. It’s a weekend I’d looked forward to all year, for many years, so being there in person was a dream of mine. I remember meeting NDP for the first time that Friday, picking him up at the airport, and being yelled at by security for taking too long. I also remember unexpectedly hooping in orange Nike Free 3.0s (as bad of a basketball choice as you can imagine) on that night, at 2am, at a 24 Hour Fitness right off the strip. I remember all of the problems that went down that weekend, and hearing the name “Pacman Jones” for the very first time. I remember the T-Mobile party, which helped launch the DWade edition Sidekick. While the technology being lauched may not have suggested it, the party itself was amazing. Not only was it DJ’d by DJ AM, were there performances by Kelis, Ludacris and Nas. There was also a pop-a-shot set up in the back corner. It was pretty much all you could ask of an All Star Weekend party. As great as all of those memories are, there’s one thing surprisingly absent. The sneakers. Other than seeing Sheed help launch the AF1 with his picture on it at Undefeated (despite not making the team that year), the footwear wasn’t much of an event that year. Sure, there as a white and gold colorway of the Zoom LeBron IV, but it just wasn’t the sneaker event that it’s grown into today. That didn’t really start to blow up until a few years later. 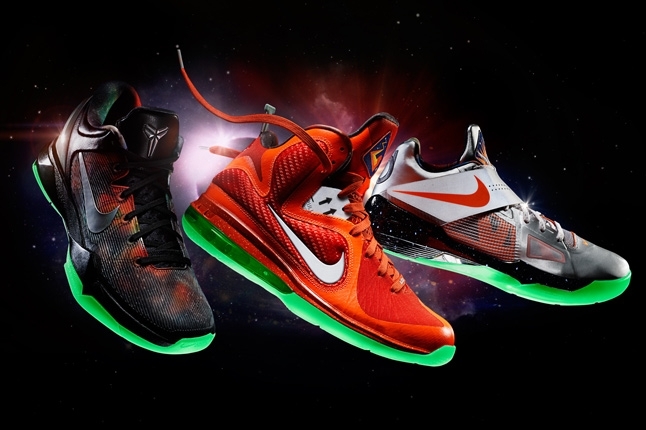 By the 2010 All Star Game in Dallas, sneaker brands had begun incorporating more connected themes across their lines. Shoes like the Air Max LeBron VII, Zoom Kobe V, KD II and Hyperize all featured a 3M wood grain print, in corresponding East and West colors. The following year, in 2011, Nike expanded on the game shoes by releasing multiple pairs of the Zoom Kobe 6, honoring the game being held in Los Angeles. The three pairs were done in colorways paying tribute to East LA (all blue), Hollywood (3D) and Orange County (sunset). But that was still only the beginning. 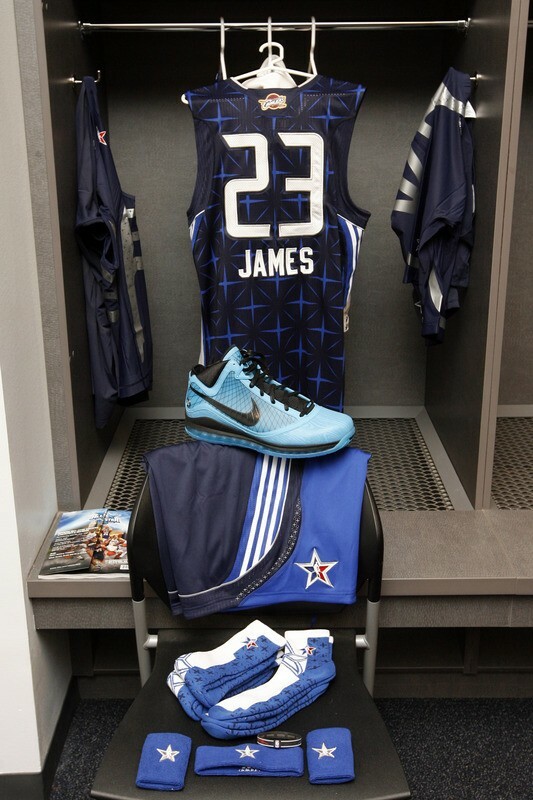 Orlando’s 2012 All Star Game provided the platform for the (first) Galaxy collection. Not only were there themed game shoes, but a full line of NSW offerings, in the same theme, as well. In fact, the Galaxy Foams stole the show, becoming the must have shoe of the weekend (and possibly the year). It’s since become an expected and anticipated part of the weekend, and as you’ve seen over the past week, this year is no different. But have you ever wondered what the shoes could have been like in the past, if such an emphasis was placed on it back then? What if things were like they are now for the 1996 game in San Antonio? We got a preview with Packer Shoes Kamikaze 2 pack, but what other shoes would you like to see in a similar theme? 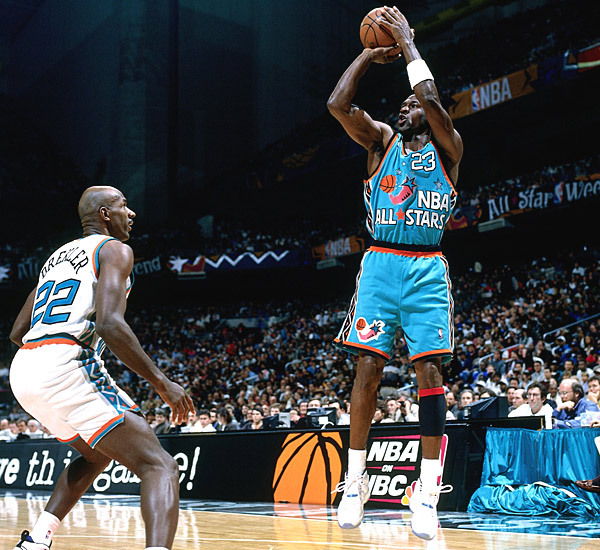 What would memorable shoes from that All Star Game, like the Air Jordan XI and Air Penny 1, have looked like if they played off those memorable jerseys? Or what about Phoenix in 1995? What would a Kamikaze 1 have been like that year if done in an All Star theme? Tell us in the comments what past kicks you would have liked to see in All Star themed colorways.